SPN has some more information about the extreme weather shelter newly opened in Sooke at the Juan de Fuca business location (CRD) at the Otter Point Business Park. (See: Extreme weather shelter arrives in Sooke.) A total of 12 beds are available (co-ed, pets allowed) at the Juan de Fuca CRD building at #3-7450 Butler Rd, when the extreme weather alert is activated. Transportation will be provided, from the Sooke Crisis Centre on Church Rd. The following information comes from Linda McLean, of the Our Place Society, the coordinating agency. Hours of operation? The shelter will run under Emergency Weather Protocol from now until March 31. Whenever EWP is activated the Sooke Shelter will be open. How many beds do you have? The space has been approved by the Fire Dept to host 12 beds. We hope that we will be able to demonstrate need to make the case for an expanded shelter operation in the future. This is a start! Any special mentions? We want to acknowledge all the efforts of the Sooke Shelter Society, Jen Wilde, the CRD (Mike Hicks), Sooke Crisis Centre, and all the local churches and community members who’ve helped make this happen and will be volunteering to help support operations. Any other comments? 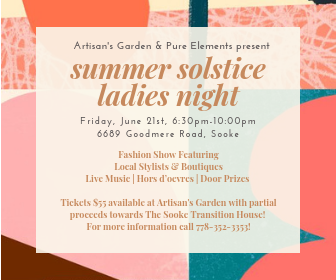 We are honoured to be able to support safe shelter in the Sooke area and plan to continue this as a seasonal shelter (open every night) in Fall/Winter 2019-20. We also hope to explore options for transitional housing options to suppprt those experiencing homelessness in the Sooke area.